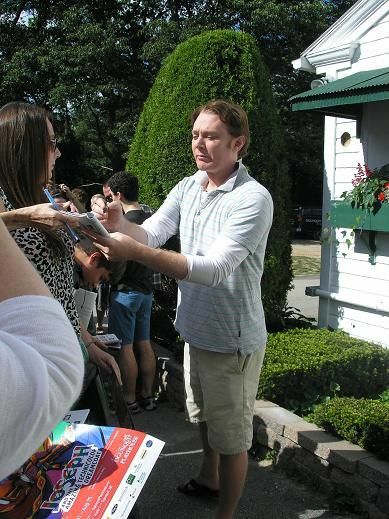 The following are some great stagedoor pictures. A big thank you to those who share the pictures with us. The following is another wonderful video of the stagedoor. This review is riveting! It confirms everything we have always admired and enjoyed from Clay on stage in a most official manner. I agree totally with Mr. Moreau that Clay’s rendition of Joseph as a shy and humble young man is refreshing and that it is his brothers’ jealousy that formats ill will and treachery. I also agree that Clay’s musical range appears unending and effortless. The review came out on my birthday and was the most fantastic present I have ever received! Loved the video, photos and the wonderful comments about Clay, so happy for him! Thanks Musicfan xox. 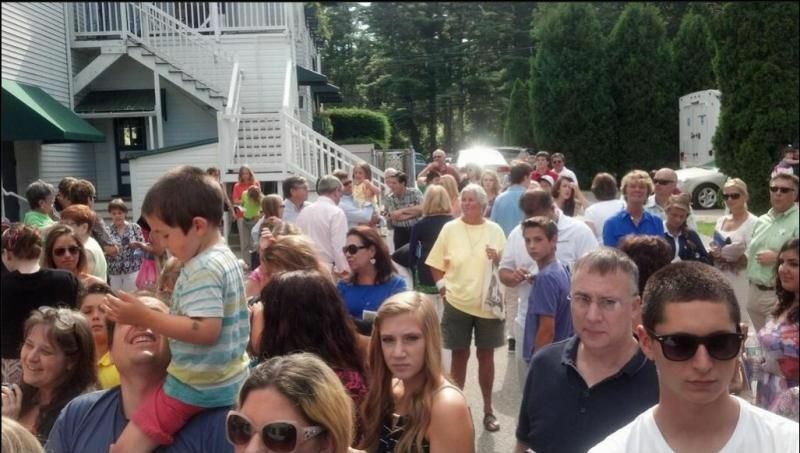 I saw Clay in Joseph at the matinee on Wed. 8/7.Got home from Ogunquit on Sat and tried to log into CANN…no luck. Finally, it works today (Mon) hurray! I picked up a copy of Tourist News while in ME. There is a wonderful article about the play written by Dan Marois in the Aug 8 – 13 vol. 55, No. 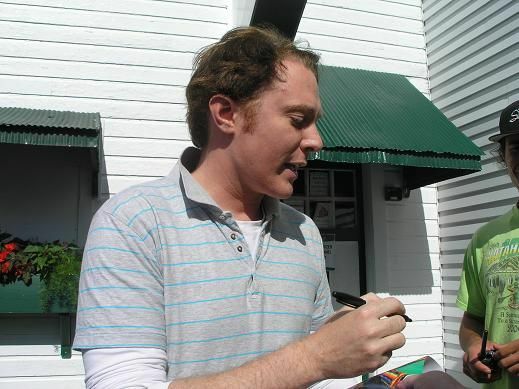 13 titled 'Clay Aiken Stars in Ogunquit's Spectacular Joseph'. 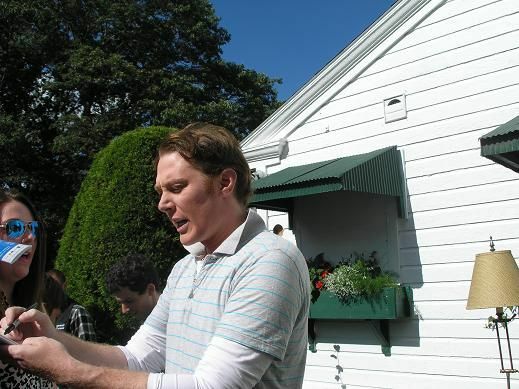 Here is a quote "The Ogunquit Playhouse could not have made a better choice by casting Aiken. He's a proven singer and confidently belts out the show standards, 'Any Dream Will Do' and 'Close Every Door'." Try finding the article at http://www.touristnewsonline.com. Emily…so sorry that you had trouble getting to CANN. But,a big thank you for trying again. Also, a big thank you to the link to the tourist news review. I will check it out. Stellar article about our guy! Why don't more people in the industry "get it" like this man does. Maybe Clay chooses his projects carefully, and only goes for the ones that are a good fit for HIM. Who knows, but I sure am glad he took THIS one! Only three more days till I meet my girlfriends and we see Clay Friday night, Saturday night and Sunday matinee! Musicfan, I finally got my CANN delivered to my mailbox this morning. I was having fits, lol. I accessed it on Facebook yesterday so all is good! What a wonderful review of Clay. I am truly loving the positive press that he is getting. And he deserves it so much. I missed your email yesterday Musicfan…but I realized that you are on vacation, so never thought too much about it. Nice to receive it this morning. Hope Clay is healed and ready to go tonight!!!! Love the stage door videos as well. What a wonderful review. I’m so happy for Clay and the whole cast. Maybe Clays next cd should be a Broadway cd including Close Every Door. Would love a LIVE cd from Clay- I think he sounds better in person than on cd's! to and uses his own voice! He is to be admired! I loved this review! Also enjoyed the pictures. I am so glad for those going that Clay is coming out to the stage door after the play. What a treat! Error: Error validating access token: Session has expired on Tuesday, 21-Aug-18 16:13:01 PDT. The current time is Thursday, 18-Apr-19 12:25:12 PDT.